See also Part I and Part II. On the way home from working on the alpine race courses in Whistler, B.C. for the 2010 Olympic Winter Games, I stopped in Vancouver to see the city's Olympic sights. In addition to seeing all the extraordinary places for the public to gather for the Olympics, I found extraordinarily diverse and abundant facilities for getting the public to the games without cars: some really nice trains to get people across the long distances and some superb facilities for bikes. Amongst the bike-friendly facilities in Vancouver, I found everything from sharrows to bike lanes, to dedicated bike paths complete with separate pedestrian lanes. Deluxe! It started with a ride from the airport to downtown on the sparkling new subway train, completed just in time for the Olympics. It's not quite a system yet since it only has one line with about 8 stops but it is a very nice beginning. This train is fully automated so there's no driver compartment to block your view at the front of the train. You can sit and look through the front windshield as you whiz through tunnels and over bridges. It was also free to volunteers of the games. I had done lots of research on getting to and from Vancouver but I hadn't done any research on getting around the city itself. I had anticipated an expensive and time-consuming bus or rental car ride into town from the airport. 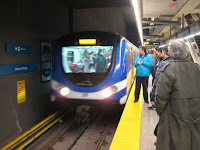 I was so psyched to have the new light rail system, the "Canada Line", to quickly whisk me into town for free. It gave me even more time to explore. The only bummer was the usual message on the train platform that instructs bikers not to use the train during times of maximum use: the Olympics. This is similar to the rush hour rule on BART in San Francisco. The stated reason is always that the train system is too congested for bikes at these times. However, it is precisely those congested traffic periods when you want people out of their cars and onto bikes. That does indeed add to congestion on trains. However, San Francisco's CalTrain system demonstrates that any increase in congestion from bikes can be addressed with a dedicated bike car. That is obviously added cost but if it removes cars from the road during congestion it provides obvious value as well. Moving on, here's the first thing I saw when I left the subway station: a guarded bike parking lot. Right on Vancouver! This is what you want if you are really serious about encouraging cycling as serious transport: real space and security for your bike while you are away. No more lugging around your own lock which has to be so large and heavy that it makes riding a pain. This kind of bike parking also means you can count on your ride being as fully functional as you left it: no wheel, seat, or light theft or vandalism to worry about. If you are returning home late at night, this place provides the kind of piece of mind and predictability you need in order to rely on your bike to get you home. 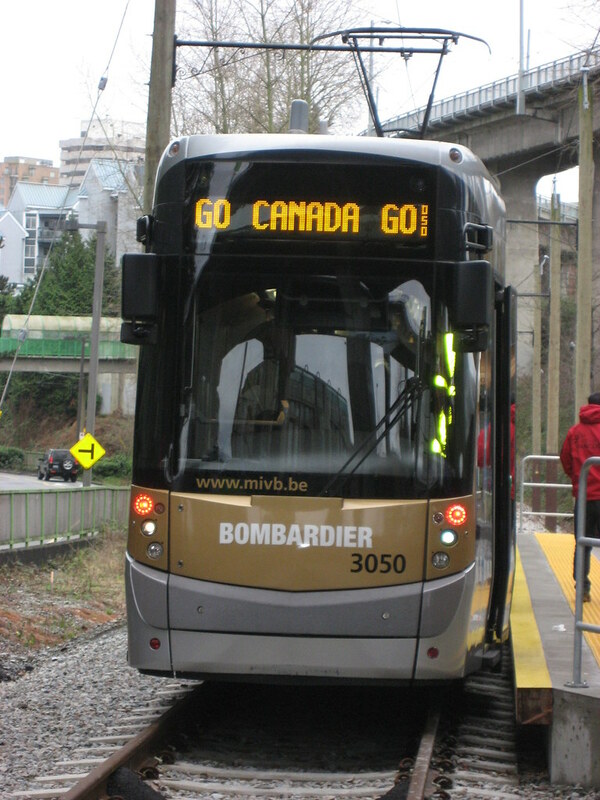 From here, I took a streetcar, on loan from the Belgium Transport Company for the Olympic games, that took me from the Olympic Village subway station to Granville Island. This thing was too narrow to squeeze a bike into but any cyclist would probably ride from a Canada Line station to Granville anyway. At this point in my trip, my bike was stuffed into a bike case at the airport so I was hoofing it. That was just as well because this clean new, oddly narrow, train was a pleasure to ride. Sadly, I'm told it will get dismantled after the Olympics. At Granville Island, I had breakfast at the Swiss House. This is the place setup by the Swiss government to allow folks to gather and cheer on Swiss athletes. They had rented the beautiful Bridges restaurant during the games which was right on the water next to the water taxi station. They also provided these electric bikes. Go Switzerland for choosing a beautiful spot with such a wealth of transportation options that do not involve a car. The breakfast, the free Wi-Fi, oompah band, and alpine skiing in HD, were all fantastic. Once I got into downtown I found all manner of bike-support. The first that I saw was a sharrow-type configuration on a one-way boulevard. Note the bike icon on the street sign. I hadn't seen that before, but I like it as a way to tell drivers and riders what to expect on the roads they intersect as well as the roads on which they are driving or riding. Second, I found dedicated paths with painted stripes to separate pedestrian and bicycle traffic. This was on the way to Saxony House: the house for cheering on German athletes during the 2010 Olympic Winter Games. These bike paths are pretty nice but the pedestrians in this photo demonstrate the problem with just using paint to separate traffic: people just ignore it. Regardless, while sitting on the back deck at the Saxony House enjoying my grilled pork loin sandwich and a beer, I found this beautiful site. This bike rack is right on the dock and, at least, one sailor was using his bike this day. Next, I found bike lanes, and dedicated bike paths that parallel the roads. Here, it is not just strips of paint separating pedestrians and bikes. These are the minimum of what you want in a bike path: an island separating cars, bikes, and pedestrians. You hear about this specified in road design theory but you rarely see it in practice, especially the separation of pedestrians. Bike lane sceptics often stress how unsafe it is to cram bikes and pedestrians on the same path. Often, you find cities address this with paint to separate the two on the same path. However, that never seems adequate. You consistently find pedestrians walking wherever they want on the path. In this case, the pedestrians couldn't ask for more. Or could they? Just when I thought Vancouver's bike facilities couldn't get much better, I saw this near Stanley Park in Vancouver. This heavily engineered, lighted, underpass was obviously not cheap to build. Yet, it is totally dedicated to human-powered transportation: bike and pedestrian lanes only. It has no support for cars whatsoever (except over its top). What a beautiful representation of Vancouver's priorities! Go Vancouver! Some of the biggest users of bicycles in Vancouver that I saw were the police. These guys were super-friendly and very enthusiastic about cycling as serious transport. Mario, pictured here not far from the Olympic cauldron, has been on a cycling beat for 2 years. He says it is his favorite kind of beat so far. I asked if the bike helped in a chase situation, he said it sometimes can. He likes that he is so much more engaged with citizens on a bike while he is still able to get around city streets about as quickly as a car. He also likes how well it keeps him in shape. The other officer pictured here is actually riding inside the airport. He had similar things to say about cycling. Cycling as serious transport does not get much more serious than this. When I look at these guys, I see calories burning, skies and roads clearing, as well as social barriers and health costs plummeting. What a wonderful example these guys are setting for the rest of us. See Part I and Part II of this story. seek and you will find, Jody. If you are looking for examples of bike-friendliness anywhere, you'll find it. Even here in the U.S.
Have you played a video game before? If you haven't, keep reading! There are great games available these days to pick from. The following article contains tips and tricks you need to know to start gaming. If buying a more info for a kid, make sure they have given you several options of what they will want. You may not know if a game is appropriate for the child's age level before you actually inspect it at the store, so make sure you have some titles to choose from. A Nintendo Wii is helpful if you want to get into top shape. There are many physical fitness games available for the Wii system.